I did it. Not perfectly, but I think my class hit the tipping point. Partly because a 10th grader held me accountable: On her reflection on our last essay, she asked, “How can I get better at sentence fluency?” And I promised her we’d work on it in our next unit. I committed to providing students information, mentors, and/or practice time (almost) every day. What did that commitment look like? This great 3-paragraph sequence from Gary Provost’s 100 Ways to Improve Your Writing that simultaneously articulates and demonstrates the effects a variety of sentence lengths can create—because sentences don’t generally stand on their own. Go back to the first 2 pages we’d annotated: find the shortest and the longest sentences. Then we all tried writing 3 sentences—short, medium, long (in any order), describing our classroom using Murakami’s “we are pure point of view” tactic. Pick 1 paragraph from our initial 2-page annotation and circle all the first words (clearly showing sentence length as well as variety of sentence starts), underline initial grammatical construct (the word could vary but the structure be repetitive), label subjects and verbs of clauses to see where in the sentences—and how close together—they occur. Find and copy a sentence you like from last night’s reading: explain to a partner why you picked it. Point out examples of sentences using a colon to separate 2 main clauses. Ask students to find more in tonight’s reading. The next day we share what we found and write our own. Analyze a mentor sentence from the text for how syntax reinforces meaning: “The higher we climb, the smaller grows our image of Eri Asai, until it is just a single point, and then it is gone” (141). Analyze a mentor sentence from the text for how diction reinforces meaning: “Ninteen years old, she is protected by a roof and walls, protected, too, by fenced green lawns, burglar alarms, newly waxed station wagons, and big, smart dogs that stroll the neighborhood” (243). Write a sentence for yourself: “Fifteen/sixteen years old, I am protected by…” and pick 3 concrete details that represent the concept of your security. Five minutes a day IS an investment. And some investments are worth it. What were some of the returns on this investment? A student began a small group discussion, “I want to talk about the syntax of this sentence….” (I have never before had a student, unprompted, correctly USE the word syntax, let alone want to talk about it with peers! One of the final responses students were required to do was to the following prompt: “Write a journal entry or letter in the voice of one of the characters. 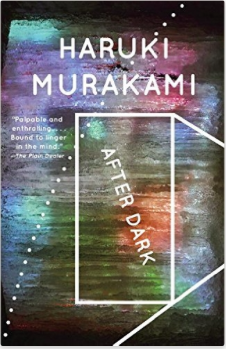 This should demonstrate understanding of the character, the book, and ability to put yourself inside the character’s head.” One I shared with a colleague who has also read After Dark. She thought it was a quote from the novel! And that’s the kind of happy we all need at this damp, dark, cold, and tired tail-end of 3rd quarter. Target. Give time. Find mentors. Practice. Pay attention. It’s how learning happens. Even about syntax. What’s something recently that you’ve had success targeting and having students learn?